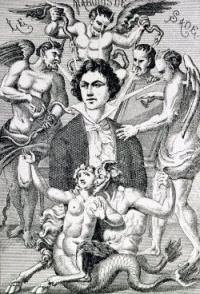 Oxtiern, The Misfortunes of Libertinage (1781) (Le Comte Oxtiern ou les Effets du Libertinage) is a play by Sade. The play debuted on October 22, 1791 at the Théâtre Molière on the rue Saint-Martin. A second performance is given two weeks later, on November 4, which causes a minor disturbance and causes the suspension further perforances. Sade will feature the play once more 8 years later, where he plays the role of Fabrice. Unless indicated otherwise, the text in this article is either based on Wikipedia article "Oxtiern, The Misfortunes of Libertinage" or another language Wikipedia page thereof used under the terms of the GNU Free Documentation License; or on original research by Jahsonic and friends. See Art and Popular Culture's copyright notice.